He was speaking to me, but I could not understand him. I was walking through a park in central Beijing on a hot afternoon, and a man was calling to me from behind a stand. Clearly, he was attempting to sell me a cold drink, but as he spoke a familiar feeling came over me. Overwhelmed, I tried to piece together what little Mandarin I knew to make sense of his words. He took the hint from my blank stares, then looked over at my Mandarin speaking friend. “Is she Japanese?,” he asked. When my friend translated the man’s question, I felt ashamed, not just because I had not understood his simple question, but because I understood so very little about my own homeland. In the summer of 2017, I returned to China for the first time since I had left almost 20 years earlier. From a young age, I knew I had not come home from the hospital like so many of my friends: rather, I had come “home” on an airplane that had departed from Guangzhou, a city in China’s southerly province of Guangdong. A few days after my birth, my biological parents had left me in a basket at the door of the city hall, and from there, I had been sent to live in one of China’s “Social Welfare Institutes” — a polite term for an orphanage. My story is a familiar one that could be told in similar iterations by hundreds, perhaps thousands of others. I was adopted a year later into a Canadian family, but many — if not most — stories of this kind do not have such happy endings. Although it is impossible to gather accurate statistics, last year there were reportedly 460,000 orphans in China, with only 88,000 being sent into orphanage care. It can only be assumed that the number of abandoned children — almost exclusively girls owing to China’s historical preference for male children — is many times higher than this figure, the outcome of the one-child policy implemented in China in the early 1980s to curb the country’s exponential rate of population growth. Ever since China opened its doors to international adoption, Chinese adoptees like me have traveled on airplanes to cities all over the world, most of them landing in the United States. On the surface, adoption, especially international adoption, seems like the perfect solution to a difficult problem. A child who does not have a family is given one, and a family without a child is able to have one. In sharing my story, my purpose is not to suggest that international adoption should itself be abandoned, but, rather, to explain the complicated feelings that accompany the practice — the pain, the loss, as well as the confusion with respect to identity. When one becomes an international adoptee, one does not voluntarily adopt a new nation and a national identity, but, rather, is adopted into one. One is a choice: the other is not, and the consequences of each are entirely different. In the most literal sense, blood represents the life force. Although we seldom see it, we know that blood is what courses through our veins, giving us life. The word “blood” is idiomatic in our everyday language. For example, the word is tied to our emotions, with a “rush” of blood indicating a surge of feeling. Our blood “boils” when we are enraged. When we are afraid, our blood “runs cold.” When we act without mercy, we act in “cold blood.” But the meaning of the word “blood” shifts when it comes to considering one’s identity, becoming what symbolically connects us to our ancestors and to our homeland. Familiar clichés surround such notions, in the forms of idioms such as “related by blood” and expressions such as “blood is thicker than water.” All of these ways of speaking underline the sanctity that, for so many people, characterizes blood relations. Blood binds us with our kin and “bloodlines” are how we trace our lineage, from our earliest known ancestors up to the present day. Although we will never meet our long gone ancestors, or even all of our living extended family, we still feel a sense of immediate connection when we learn of our relation to them. We may connect our personality traits or accomplishments to theirs. If our relatives or ancestors have achieved great things, we hope to see some of their greatness reflected in us. But for an adoptee, the role of “blood” in the formation of relations must take shape as some larger, more universal bond of connection to be forged in a more abstract manner. There is no other choice. The color red has long been the color of good luck and prosperity in Chinese culture, and under the Communist regime, the color continued to serve as a potent and politically charged symbol. And though I did not grow up in China, red was also often present in the encounters I had with the country of my birth. I saw it in the red and gold decorations at the Chinese restaurants where I ate with my family, and in the bright red sauce that came with a dish of deep fried chicken. Red was the color of the decorative lanterns my mother and father hung in our home for the Chinese New Year, of the Chinese silk dress I wore as a child, and of the envelopes of money and candy I received from my parents to celebrate the Spring Festival. As a result of my many childhood encounters with red, the color is laden with significance for me and inspires feelings of familiarity and nostalgia. “Red” has served as a bond with my lost world, and it has also come to symbolize my adopted home. Red is the color of the maple leaf on our Canadian flag, and of the two bright red bands that frame it. Red is the color of the maple leaves falling to the ground in autumn, of forests on fire with the change of seasons, of the Canadian mounted police, of crimson sunsets over the Great Lakes. Red was the color of the strawberries I picked in summer and the bright apples I gathered in autumn, the color of my winter snowsuit and of my hands and my face after a day outside in the snow. Red was the color of Christmas ornaments, of the stockings I hung by the fireplace, and of the hair of that iconic Canadian fictional character, Anne of Green Gables. My name is Lauren Turner, an unambiguously white Anglo-Saxon name. But when you look at me, you will soon see the incongruity between my name and my face. “I” exist in that in between — my name connecting me to my home in Canada, but physical features, such as my dark hair and monolids, connecting me to a homeland about which, as a child, I knew very little. It was during holidays in particular that I felt most “in between.” On the Chinese New Year, I wore a silk dress, whose significance I did not fully understand. During the festive dinner that marked the occasion, I would eat Chinese food, listen to Chinese music and to stories about China. But always, I felt more at ease with holidays like Easter and Christmas, holidays shared by my extended family and friends. Celebrating these holidays gave me a greater sense of belonging in a world where I sometimes felt like a placeholder for the Caucasian child my parents could not have. You are supposed to take the name of this absent child, assume their place in their family, and adopt their native tongue. Yet, with my black hair and facial features, how could I really take the place of that absent child? And how could my adoptive parents really take the place of my biological parents, and my adopted culture the place of my culture of origin? The new culture, the new identity are supposed to become yours. Still, you never stop being aware of your otherness. When I was growing up, I often wondered why I did not look anything like my parents or my extended family. At family gatherings, relatives would compare my brother, who is my parents’ biological child, and my cousins to each other, noting similarities in appearance and personality. I would hear comments like: “Your grandfather looked just like you when he was your age” or “My, don�t you have your grandmother�s eyes!” or “That�s exactly what your great-aunt would say.” While family members tried to include me in these conversations, I often felt that my adoption and obvious otherness was the elephant in the room — or should I say, like a crouching tiger, something of value to me that I must hide. At school, mine was the sole Asian face in my class and I regretted that I did not resemble my Caucasian classmates. As I grew older, I found my classmates often made assumptions about me, based solely on my race. To them, I was Asian first, with any other part of my identity coming in a distant second. In order to belong, I felt I had to “run” away from my homeland. I wanted to proclaim my belonging to Canada, and to do that, I needed to distance myself as much as I could from China and prove my Canadian-ness to those around me. An adopted identity. A forgotten history. Longing for a lost homeland I never knew. But how can you long for a place you do not know and never did know? And should you yearn for a place whose twentieth century history is fraught with shameful episodes that are spoken of in your adopted country with judgment and hostility? The other option: erasure. But maybe the vanishing had already taken place? When I boarded the plane bound for my new home, my fraught history disappeared — the identity of my birth parents and the complex sociopolitical reasons for giving me away vanished completely. In order to become “Lauren Turner,” Lai-Sying had to disappear. Shrouded in myth and misperceptions, my country of birth seemed largely unknowable. What I could know of it seemed filled with contradictions. The children’s books I read told me China was an ancient civilization overflowing with elegant porcelain vases, powerful emperors, and beautiful empresses moving serenely through palaces in long silk gowns. While the China of the past seemed vibrant with beauty and color, the China of present was another China altogether, a backward place full of ignorant and desperately poor people. Above all, I believed that China was a place in which girls were not wanted — abused, abandoned, and even killed. For me, two Chinas came into being: the China of my imagination, and the “real” China from which I came. I felt a deep sense of shame about that country and had no corrective lens through which I could view it more accurately. My yearning to assimilate, together with the shame I felt about the country of my birth, kept me locked in the grip of a contradiction. How could I belong to either of these two Chinas if I needed to leave so much of my true self behind to do so? Could I ever fit in either place? I was lost on a meandering alleyway that had turned out to be a maze. I tried in vain to escape. It was dark when we landed in Beijing, and when I stepped off the plane, part of me hoped to feel an immediate connection with the land of China and its people. My people. But I did not feel it then, nor in the days that followed. This did not feel like the homecoming I had hoped for and anticipated, even though for the first time in my life, I walked among a sea of faces that looked just like mine. I wanted so much to belong, but instead, I felt like a stranger in my own homeland. As the days passed, it became clear: the “China” I had constructed in my own mind and the China I saw before me, were two entirely different places. The one China was a real physical place, while the other China was the country of my imagination. All the complex feelings I had about my adoption, all the expectations and hopes I had about the country of my birth lived only in this imaginary China, a place that was somehow more real to me than the real China. Both countries had their own histories, their own cultures and realities, and I had grown up and now existed in a country located somewhere in between. Was I Canadian or was I Chinese? When I was young, I had tried to suppress my Chinese identity and assert my Canadian-ness. I had devoted all my energy to trying my best to resemble my white family, my white friends, my white classmates. Chinese or Canadian — I felt I had to choose. Yet wandering through the streets of Beijing, it occurred to me that I could choose to think about myself differently — in a new way. 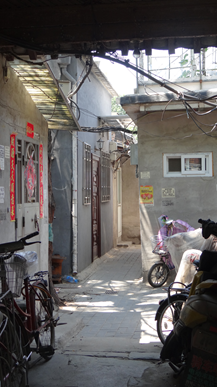 As I walked through the hutong neighborhoods, I found myself ensconced in crooked, crowded alleyways that veered off at their peripheries. As I thought about it, I realized they offered a metaphor I could work with: I was a person whose identity was complex and tangled and crowded by so many conflicting feelings, some painful, some joyful, but all of them confusing and difficult to make sense of. Navigating this identity was so difficult that at times I felt utterly lost. But as I walked the crowded narrow alleyways of Beijing, I realized, for the first time, that this is how many people must move through life, navigating the unexpected, making sense of places that seem disconnected, discontinuous — places that change over time as they are continually recreated by those who inhabit them; places that are made from what was, what is, and what will be. As I stopped to look up at the red lanterns hanging from the eaves of the houses in that narrow Beijing alleyway, I thought of red — how this color had haunted me all my life, serving as the bloodline that ran through both of my countries, and giving me life so I might find my way along all the narrow, difficult roads I have had to travel. And then I knew that it was not China or Canada, but red that had and would always be my country — a country in between. 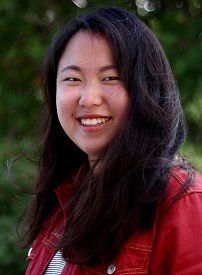 Bio: Lauren Laisying Turner was born in the southern Chinese province of Guangdong, but came to live with her adoptive family in Ontario, Canada, when she was one year old. She is currently in her third year of studies at the University of Toronto. She is an avid traveler, and has spent extended periods of time in Italy, Iceland, and Japan. Recently, she visited China for the first time. When she graduates, Lauren would like to find work in an NGO. This is Lauren’s first publication. Wherever she is, what ever she is doing, she plans to continue writing.